In honor of the fact that last Sunday was Mother's Day, this week's post is another one that skips just across the border into our neighboring state where my mother lives. Additionally, while the Okefenokee Swamp is located mainly in southeast Georgia, the southern edges of the swamp spill over the border into north Florida. 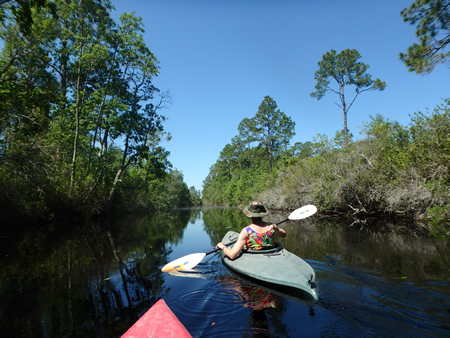 The swamp is also the location of the headwaters of the Suwannee River, one of the largest - and arguably the most well known - river in the state of Florida. (You know, way down upon the Suwannee River.... There's your earworm for this post!) As such, I feel wholly justified in including it here on Desolation Florida. 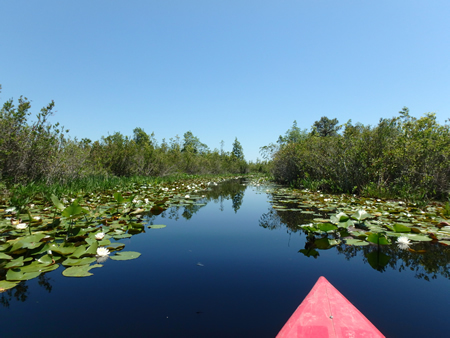 The Okefenokee Swamp currently covers roughly 700 square miles (1127km), although it would have once been larger as development near its edges, logging, and attempts to drain it have caused it to shrink in size in the modern era. 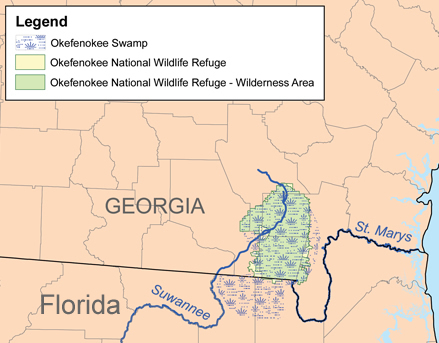 I learned as a child that okefenokee was a Seminole/Creek word meaning land of the trembling earth. In many ways this makes sense to speakers of English who have ever attempted to walk across or through a swampy area; however, it seems that explanation may actually be a folk etymology loosely based on the Creek words for water (oka) and shaking (fenoke). Both the swamp itself and the surrounding areas had once been thick with longleaf pines, slow-growing trees native to the area, which can take up to 150 years to reach maturity. 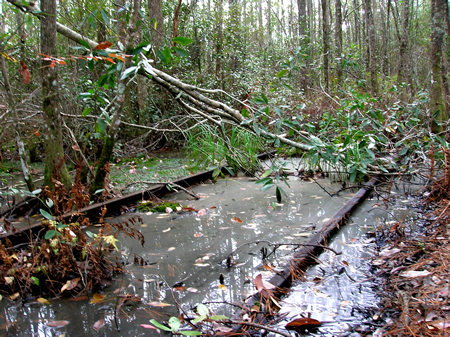 In the 1880s, the swamp was essentially encircled on all sides by railway lines. 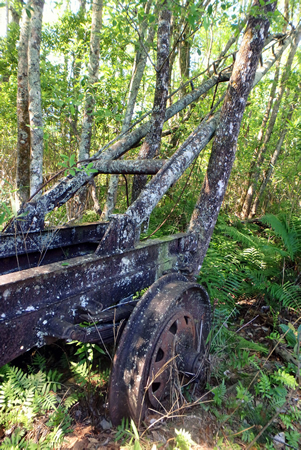 This enabled loggers an easy way of transporting logs to market, and by the turn of the twentieth century the easily accessible (er, dry) lands bordering the swamp had been denuded of longleaf pine. Once the easy to access longleaf pines surrounding the swamp were gone, timber-profiteers looked for ways to access the cypress trees growing within the swamp. The first attempts were made by the Suwannee Canal Company in the 1890s, which tried first to drain the swamp and later tried to use steamboats to access and remove timber. Both attempts were unsuccessful. 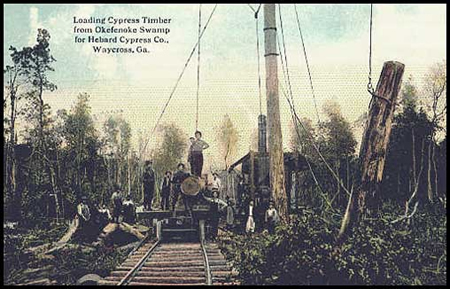 In 1901, the bulk of the swampland itself was purchased by Charles Hebard and his sons, owners of the Hebard Lumber Company, and they approached cypress logging in the Okefenokee in a different way. 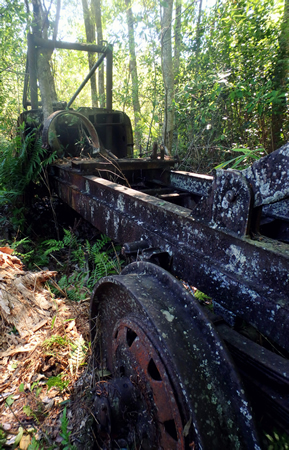 They constructed a cypress mill on the northern edge of Waycross, GA (in an area which to this day is known as Hebardville), a rail line connecting the swamp to their mill, and a network of rails through the swamp. Rail lines would be constructed in order bring equipment in and lumber out, and would be removed/rerouted once an area of swampland had been logged. 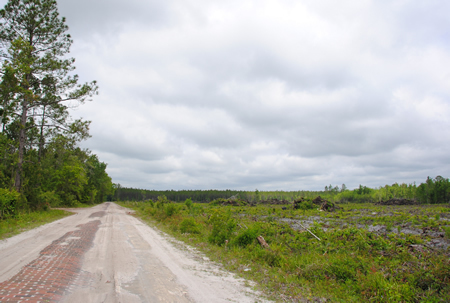 Logging continued in the swamp until the late 1920s, when the vast majority of the cypress had been culled. 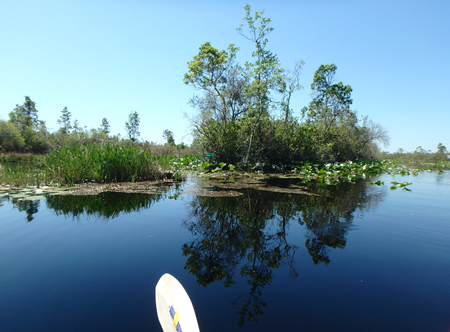 In 1937, the swampland owned by the Hebard Lumber Company was sold to the US Government in order to create what is now the Okefenokee National Wildlife Refuge. 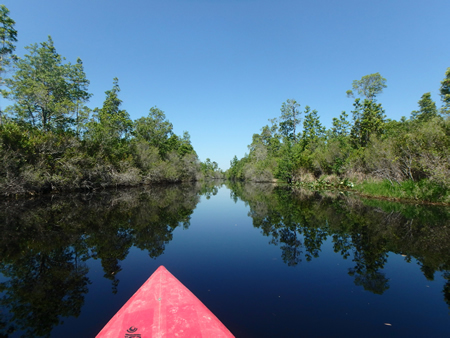 One of the four public access points to the Okefenokee National Wildlife Refuge is Kingfisher Landing, little more than a parking lot and a boat ramp located at the end of a dirt road heading west from US 1 from an area known as Racepond, GA. 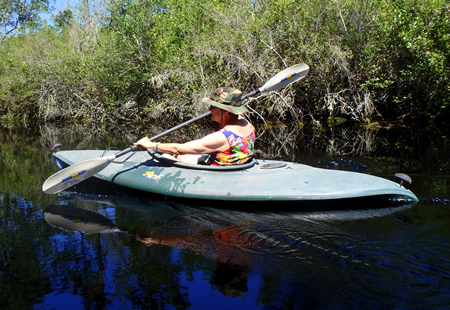 It's a convenient place to put in a canoe, kayak, or shallow-bottomed motor boat, and my mom and I decided to take our kayaks there on Mother's Day. 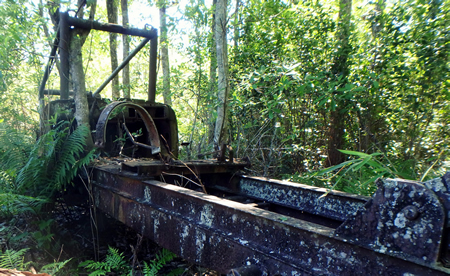 In the woods just west of the parking lot, if you know where to look, you can see the remains of some rail-mounted logging equipment and some rails running westward into the swamp. While the previous pictures were taken last Sunday, I took this shot of the tracks back in 2006. The tracks are still there, but the area is much more overgrown now, and I was unable to get a photograph on Sunday in which they were clearly visible. 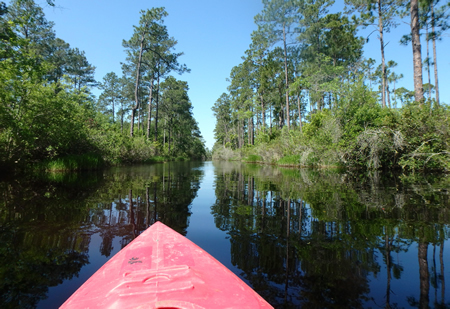 Much of the park is accessible only by canoe or kayak, and there are some lovely canoe/kayak trails. Mom and I put in our kayaks at Kingfisher Landing and did three miles out and three miles back. 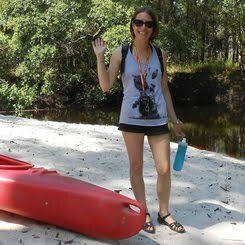 Oddly enough, this was the first time I'd been to the Okefenokee without seeing a single alligator. Usually they are all over the place, but I didn't spy a single one. Every time I thought I saw one, it just turned out to be a branch or a log, floating in the water. (Usually it's the other way around; you think it's just a branch or a log until it moves!) We saw some birds (although surprisingly not many) and an uncountable quantity of dragonflies. The weather was absolutely glorious and perfect for kayaking... and in true desolation form, there was hardly a soul in sight. Welcome to the "Land of Trembling Earth"
Go on. Sing it to the tune of follow the yellow-brick road. You know you want to. 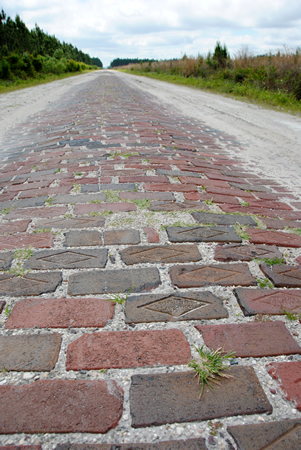 Now that you’ve got the earworm going, you might be wondering what old, worn, brick road it is that you’re singing about. 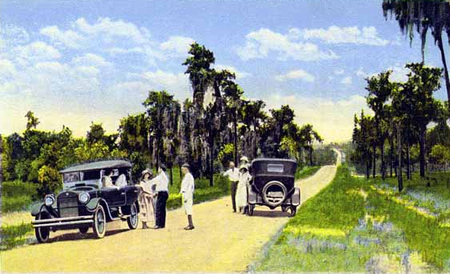 To answer that question, you’ve got to go back in time just a little over a century to around 1914, when residents of what is now Flagler County (at the time it was part of St. Johns County) voted for the creation of a quality highway to connect local communities. As cars had started to become an ever more popular mode of transportation, residents – and tourists – desired better quality roads upon which to travel; sandy and swampy tracks passable by horse simply weren’t going to cut it for the average Model-T.
Beginning with the Federal Road Act of 1916, the US Government began to become involved in the construction of long-distance highways. Funding and support for predominantly private highway associations such as the Dixie Highway Association began to dissipate as the federal government’s role in highway development and maintenance grew. 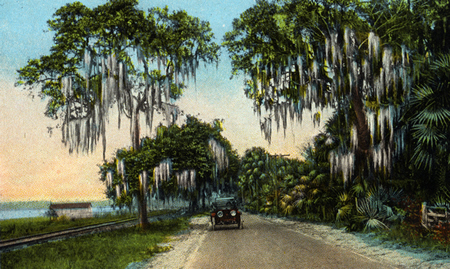 In Florida, federal highway US 1, which runs from Key West northward through Jacksonville and on into Georgia (and which continues all the way to Maine), was constructed in the late 1920s and early 1930s. Much of US 1 paralleled segments of the Dixie Highway (albeit with some areas being farther from the old route than others), and with the Dixie Highway no longer needed or funded, it fell into disuse and disrepair, and nearly disappeared altogether. I periodically see signs here and there for turnoffs to the Old Dixie Highway when traveling along US 1 in both Florida and Georgia, but no longer is there a ‘Dixie Highway’ linking the towns of the southeast. 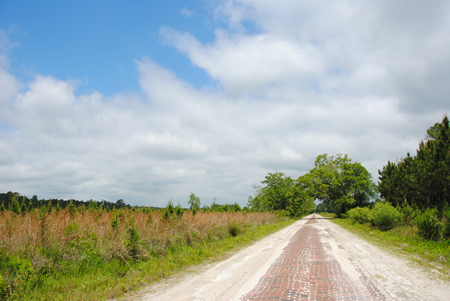 Much of the original network of the Dixie Highway had been paved in brick; however, few stretches of the original brick roadways of the Dixie Highway remain. 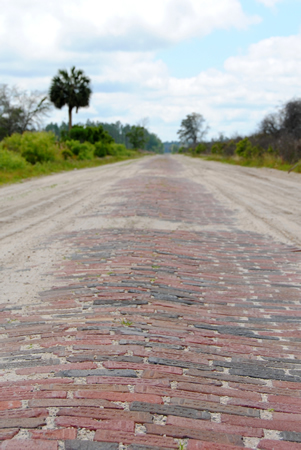 When US 1 was constructed in Florida, it was built out of asphalt. In areas where US 1 followed the same path as the existing brick highway, the bricks were torn out to make way for the pavement. 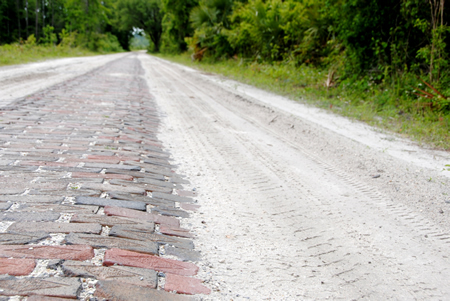 In other areas the bricks of the road were reclaimed for local use, and in others the roads were abandoned or unmaintained, the bricks left to sink into the sand and swamp of Florida. 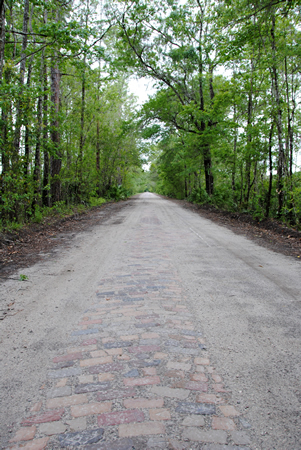 However, small stretches of the Old Dixie Highway in its brick-paved glory remain. A couple of weeks ago, JOM of Gravel Cyclist took me to a particularly fantastic stretch of the Old Dixie Highway, running north from the small town of Espanola approximately 11 miles before ending at its intersection with CR 204 in southern St. Johns County. As always at this point, pictures speak louder than words. Additionally, if you’d like to see a video of the Old Dixie Highway from a cyclist’s perspective, check out this excellent video put together by JOM of Gravel Cyclist. 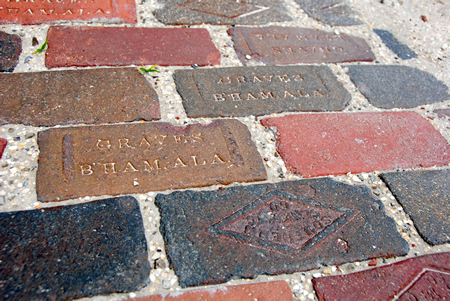 In some stretches, the bricks were barely visible under the dirt, gravel, and limerock. In other areas, the brickwork was clearly visible. There was little more than planted pine-forest along this route, all in varying degrees of the plant-grow-harvest cycle. Here the pines to the right had recently been logged. 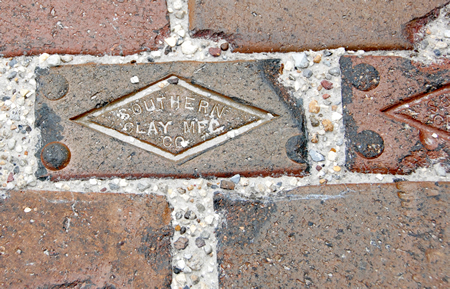 In this stretch of the Old Dixie Highway, we spotted bricks from two different companies, the Southern Clay Manufacturing Company of Robbins, TN and the Graves Brick Company of Birmingham, AL.